Olympian Mary Kom, who was in Mumbai attending press conferences and endorsing initiatives before heading home, proceeded to Bandra Fort in Mumbai's western suburb. The boxer was lending supoort to P&G's Moms For Playgrounds initiative along with actresses Mandira Bedi, Suchitra Pillai and Raajeshwari Sachdev. 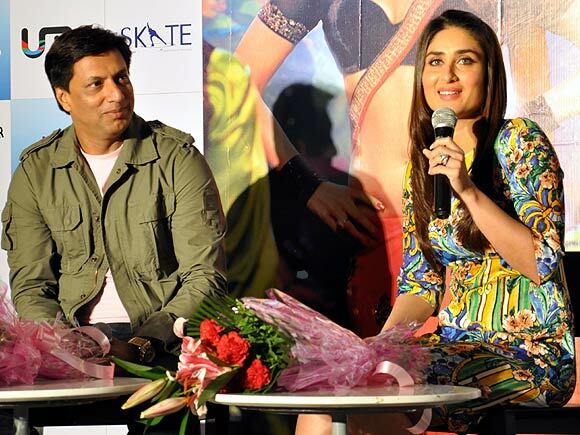 Filmmaker Madhur Bhandarkar and his lead actress of Heroine took off to Gurgaon for a press conference as part of the film's promotions. Kareena Kapoor looked dewy fresh in an eye-popping number as she interacted with the media. Actress Minissha Lamba attended the cover launch of Maxim's latest edition at Tote On The Turf in Mahalaxmi, South Mumbai. The cover girl looked luminous in a sequinned Rohit Gandhi-Rahul Khanna dress. Jackky Bhagnani joined costar, South actress Nidhi Subbaiah at the launch of the song Boom boom from their new film Ajab Gazabb Love in Andheri, a western Mumbai suburb. Directed by Sanjay Gadhvi, the film will have the actor flaunting his newly acquired eight-pack abs. Which Actor Makes The Best Onscreen God? VOTE! Like Ash, Deepika's style quotient? VOTE!